Poultry manure is often sold in dried and pelleted form by garden centres and is a good non-chemical fertiliser. Dried, pelleted and powdered forms are distinct from fresh domestic poultry litter, which is best used on the compost heap. Poultry manure products are one of the most commonly available non-chemical fertilisers on the market. Poultry manure is a useful source of nitrogen, the main nutrient that plants need for green leafy growth. It also contains smaller amounts of other important nutrients. However, poultry manure is low in nutrients compared to synthetic fertilisers such as Growmore, as illustrated below, and it is slower to release its nutrient content, some of which will not be available until the soil warms up in late spring and summer, even if the product is applied in late winter or early spring. Fresh manure from commercial poultry operations is rarely available to home gardeners, as it is unpleasant to transport and use. If you are able to access a source, then it can be used as a spring top dressing for crops requiring plenty of nitrogen, such as blackcurrants, vegetables and plum trees. It can also be put on the compost heap, adding a 5cm (2in) layer to every 15cm (6in) of other material. Fresh and composted poultry litter may contain bacteria that are harmful to humans. Avoid breathing in the dust of these products, wear gloves when handling them, and avoid eating and smoking while working with them. Avoid using poultry litter during confirmed or suspected outbreaks of bird ‘flu if you are in an affected area. Dried and processed poultry manure products, such as pellets and powders, are often sterilised during manufacture, so are less of a risk. Dried poultry manure can be used on vegetable and fruit crops, although additional potassium fertiliser may be needed (e.g. sulphate of potash or organic potassium-rich fertilisers derived from sugar beet processing). The pH (acidity or alkalinity) of poultry manure varies according to its age, the diet fed to the birds, the age of the birds and the litter materials used. Most poultry manure is in the range of pH 6.5-8.0, being neutral to moderately alkaline. 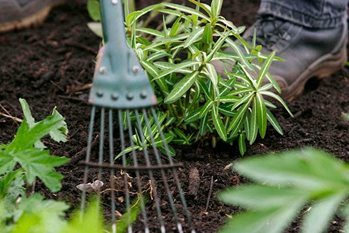 Because of its tendency towards alkalinity, poultry manure is unsuitable for lime-hating (ericaceous) plants, such as rhododendrons, azaleas, camellias, blueberries and heathers. An average dose for top-dressing is 150g per sq m (4½oz per sq yd) for most crops. However, it is better to under-dose than over-dose, as more can always be added later. For less hungry crops or lawns at risk of scorch, 100g per sq m (3oz per sq yd) may be preferable. For greedy vegetable crops use 200g per sq m (6oz per sq yd), but split this into two doses with a four week gap between applications. Domestic chickens and other birds are usually kept in coops with a shallow layer of sawdust litter. The litter tends to be wet and smelly, and often has a layer of newspaper underneath it. Fresh poultry droppings are very alkaline in pH compared to the dried manure or the litter as a whole. While the deep litter produced by poultry farms might be suitable for direct garden use, domestic poultry litter is generally unsuitable for this purpose. Used fresh, it could burn plant roots, attract vermin and foxes, and would also be unattractive in appearance. However, it makes an excellent compost activator, and we advise gardeners to compost their domestic poultry litter with other garden waste. Gardeners should be aware that fresh, wet poultry droppings can scorch both lawns and garden plants, and are (weight-for-weight) much lower in nutrients than dried poultry manure products. Dried poultry manure pellets are sold by many garden centres. Nutrient content may not be quoted on the packaging, as detailed labelling is not required of unmodified natural manures, which by their very nature do not contain standardised ingredients. Poultry manure is sometimes composted, crumbled to a powder and sold under different proprietary names without any indication of its nature on the packaging, this not being required of unmodified natural manures. However, its origin is usually evident from the characteristic smell and the presence of small feathers in the powder.